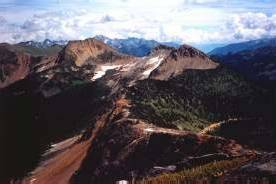 A very interesting and wilderness area that's gaining popular with hikers everywhere is the Stein Valley that is located near the village of Lytton, in southwestern British Columbia. The Stein Valley River and Trail are located in the Vancouver, Coast and Mountains tourism region of B.C. This 109,000 ha (269,342 acre) watershed is the last unlogged, intact watershed in British Columbia that's within 160 km (100 miles) of a heavily populated centre. The Stein Valley is just over a three-hour drive from the city of Vancouver. To reach the Stein Valley from Vancouver, take the Trans Canada Highway (Highway 1) that will take you to Lytton, located in the High Country Tourism region, and easy access. Or you can gain entry to part of the Stein Valley by taking Highway 99, the Sea to Sky Highway, from North Vancouver to the Pemberton Valley/ Mount Currie Area. The Stein Valley area has for centuries had a very special and spiritual meaning to the aboriginal people in this region, and has many unique pictographs and petroglyphs. The aboriginals and environmental groups were victorious in their effort to keep this area as an unlogged and unscarred wilderness. 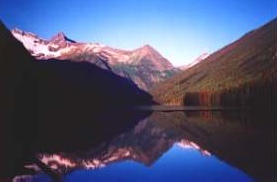 On November 23 in 1995, the Stein Valley Nlaka'pamux Heritage Park was formally made official, and this region is jointly managed by the provincial government and the Lytton Indian Band. There are no roads in the Stein Valley, which is approximately 60 km (40 miles) long and set in a showcase of spectacular peaks. The valley is populated with a variety of trees species-ponderosa pine, cottonwood, birch, Douglas fir, cedar, and spruce-and carpeted in its upper reaches by floral alpine meadows. The highest point in the Stein Valley is Skihist Mountain which is 2925 m (9759 feet) at the summit. 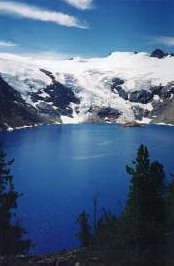 Within the watershed are three small glaciers, more than 500 sq.km (200 sq. mi.) of alpine meadows, four large lakes and an abundance of wildlife, including black bears and grizzlies. The Stein River starts as a trickle, traveling through one lake and a series of waterfalls on its way through the high meadows. From here, it drops quickly to Stein Lake at 1020 m (3400 ft.) before it reaches the valley floor; along this last 64km (40mi), the Stein drops 800 m (2640 ft.) as it rushes to meet the Fraser River, at Lytton. From Vancouver and the lower mainland, either Highway 1 or Highway 99 will take you to this region of British Columbia. Highway 1, the Trans Canada will bring you to Lytton. If travelling by the Sea to Sky Highway, take Highway 99 from North Vancouver to the Pemberton Valley/Mount Currie area. The trail starts at the Van Winkle Flats sandy bench land and winds 58 km (36 mi.) up to Stein Lake. The first section passes through the lower canyon, where the Stein has cut a narrow gorge. You make your way along the Devil's Staircase and the valley bottom to Earl's Creek - this winding part of the trail is easy going. When you reach km 11.6 (mile 7) a hand-operated cable car takes you over the river to its north shore. At a point 28 km (18 mi.) from the trail head you come to Cottonwood Creek, flowing into the Stein from the North, and named for the tall black cottonwoods you will find in numbers here. Continue through more desolate region until you reach Scudamore Creek. At this point a second hand-operated cable car, strung between two large Douglas Firs, means another crossing. 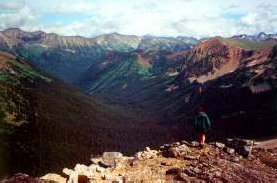 At Raven Flats, Scudamore Creek enters the Stein River as the Stein River Valley narrows to a very steep gorge of 1220 m (4000 ft.). The trail starts to steadily climb and continues steady up into the portion of the valley known as the Upper Canyon, and from there the trail leads to the alpine areas above Stein Lake. This region is heavily wooded and you are now at an elevation that reaches 1035 m (3395 ft.) and at the end of this backcountry trail. The Stein Valley Nlaka'pamux Heritage Park is a wilderness area. 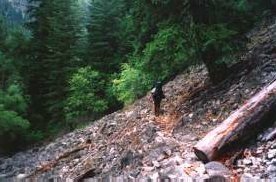 There are no support services on the or near the trail, after you leave Lytton, so be well prepared. This means you must be self sufficient and caution should be exercised at all times. Hikers may camp anywhere along the main route, but no facilities are provided. The suggested hiking time to do the complete trail is about a week. The hike is recommended for families with teenagers. There are two more hiking access points, which will take you to trails that are much shorter and ideal for weekend hiking. Both of these acess points are off Highway 99 in the Pemberton Valley area. One of the trails is from Lizzie Lake along Lizzie Creek that takes you to an alpine region that heads over to the Stein Divide. Access to the Lizzie Lake trail head is from the Lillooet Lake Road, which is located south of Mount Currie. Still another hiking trail is off the Duffey Lake Road that follows Blowdown Creek to Blowdown Pass. This trail offers the hiker good views of the Stein Valley. These two hiking trails are much shorter than the 58 km (36 mi.) hike that takes you the full length of the Stein River and Valley Heritage trail, but all three are wilderness trails. Photos courtesy of BC Parks, Thompson River District. Thanks also to John Walker for first hand information.